A planned visit by my brother over August Bank Holiday to experience and photograph dragonflies meant it was time for a return visit to Bramshill. Bank Holidays always draw the crowds to the New Forest, so heading in the other direction is the sensible option. Bramshill is usually a great spectacle in late summer, however our Saturday visit didn’t bring forth the expected bounty. Lack of sunshine kept the temperature down and the dragonflies hidden. 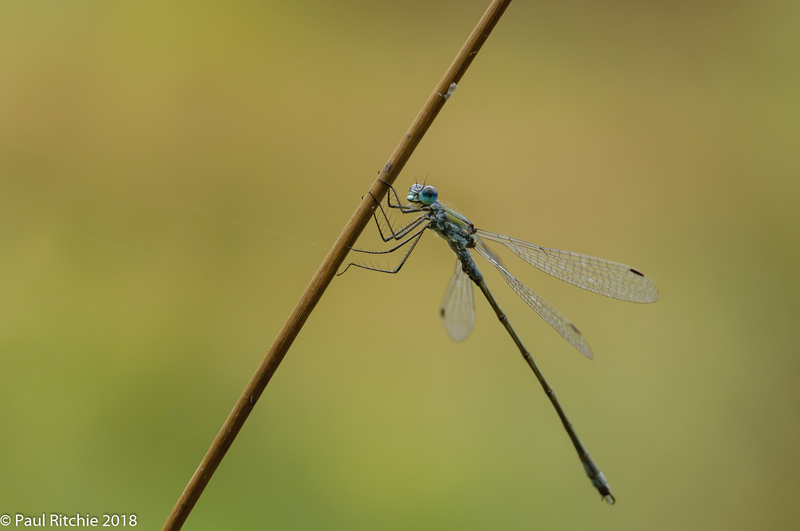 It wasn’t until we were halfway down the main track that we encountered our first Odonata; the always present Common Blues and a single female Ruddy. 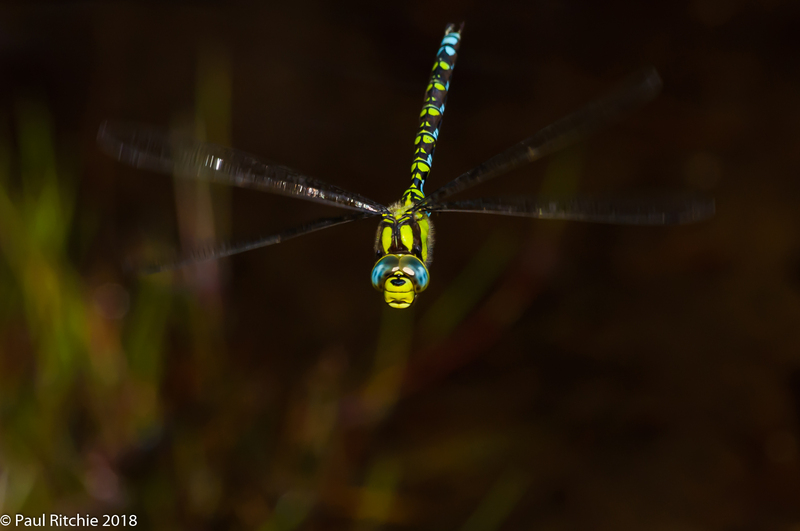 Long Lake provided a brief glimpse of a male Migrant Hawker around the rushes and only a few damsels braving the cooler conditions. By the time we reached the Green Pond the sun finally decided to make an appearance, and the pond exploded into action under the welcome heat. 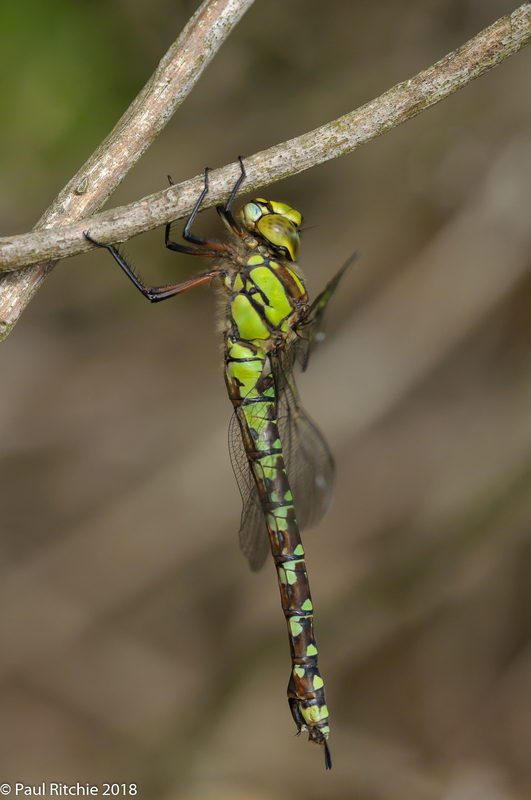 Just enough time to witness another Migrant patrolling the far bank and a bevy of Common Emeralds along the margins. Over in the south-west corner Adie disturbed a male Southern who characteristically checked us both out at close quarters before disappearing off to roost somewhere. The rise in temperature also brought out a few Ruddy, desperately grabbing the remaining warmth from ground level. 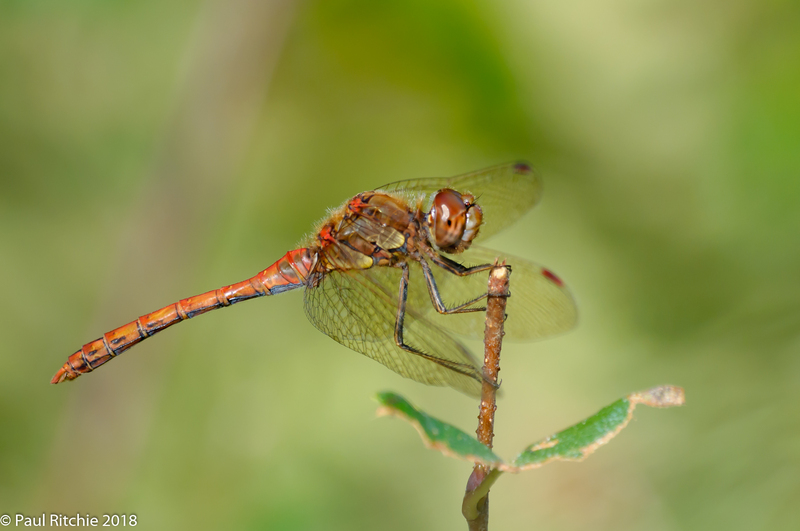 I was amazed at the lack of Common Darter – not one had shown throughout our 4 hour stay. 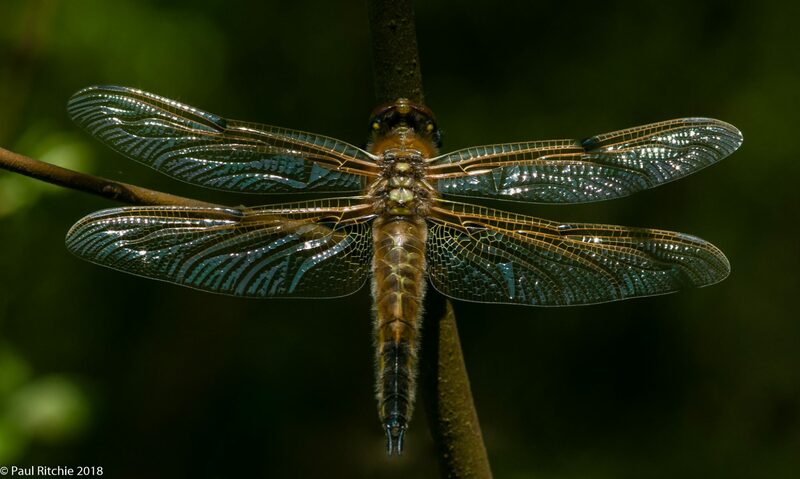 Nevertheless it was a perfect insight into a typical dragonfly experience, albeit one of the slower days spent hunting rather than shooting, and Adie thoroughly enjoyed the experience. I was determined to get another day in before the months close, and given a day of ‘sunny intervals’ returned to Ramsdown in the hope of finding a few hawkers. The day started well with a female Southern offering herself as the catch of the day. Always a pleasure to find a female away from water and always a worry she may not stay around. Thankfully after rising a few times she settled long enough to engage with the macro. Buoyed on by this good fortune I was ready to engage with the next subject and placed myself next to the pond and waited for the sun to appear. 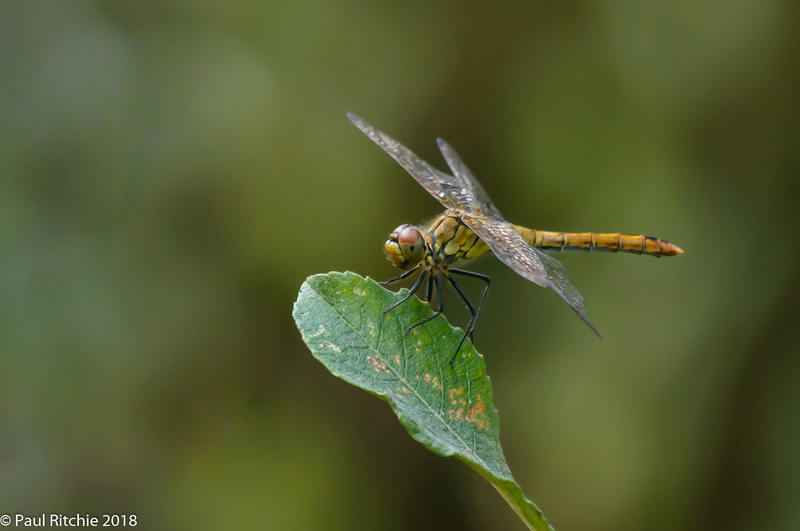 It was already warmer than Saturday and at least there were Common Darter here. Several tandem pairs and a few single males desperately trying to engage or battle with other suitors. It was a while before a hawker made an appearance. A male Migrant kept at a distance across the sedge before the welcome visit of a male Southern, possibly the same individual as ten days previous; certainly the same behaviour. After half an hour he disappeared followed shortly after by the sun. Still, a couple of keepers from the day meant I could go home satisfied. An afternoon trip to Crockford to see how things were. Very quiet except for Common Darters and one Golden-ringed, which was a pleasant surprise. A walk around Norleywood produced a low-flying Southern Hawker who didn’t hang around and more Common Darters roosting in a sunny clearing.